Dr. Capeci and staff were very nice. Dr. Capeci could only recommend an MRI for me right now to see whatis happening in my knee. We'll see what the next appointment brings once he has the MRI results. Dr. Capeci and staff were very nice. Dr. Capeci could only recommend an MRI for me right now to see what is happening in my knee. We'll see what the nextappointment brings once he has the MRI results. Informative. Answered all my questions. Xrays done promptly in office. Offered short term solutions that I sought at thetime. Informative. Answered all my questions. Xrays done promptly in office. Offered short term solutions that I sought at the time. Dr. Craig Capeci is a Board Certified specialist in the orthopaedic care of sports related injuries as well as arthroscopic and reconstructive surgery of the shoulder, hip, knee and ankle. He is a Clinical Assistant Professor of Orthopaedic Surgery at New York University Hospital for Joint Diseases. A native of Brooklyn, New York, he attended Hunter High School in Manhattan. 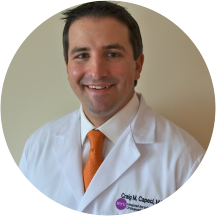 Dr. Capeci graduated from Cornell University and received his medical degree from New York University School of Medicine where he was elected to the prestigious Alpha Omega Alpha medical honor society. He completed his residency in orthopaedic surgery at New York University Hospital for Joint Diseases and a sports medicine fellowship at Lenox Hill Hospital. During his residency and fellowship he participated in the orthopaedic care of the New York Jets football team, New York Islanders hockey club, Hunter College Athletics and NYC Public High Schools. Dr. Capeci has published multiple articles and presented at grand rounds and research meetings on topics including hip fractures, hip arthroscopy, cartilage injuries of the knee, shoulder instability and posterior cruciate ligament deficiency. In his free time, he enjoys spending time with his family, cooking, computers & technology, playing golf & basketball and following collegiate and professional sports. Knowledgeable, Good EQ & Pleasant. Dr. Capeci and his staff work with care and efficiency, a combination I value. Excellent doctor, very professional, good listener and was able to diagnose my issue right away. Was seen right away and the entire office was very punctual. Dr. Capeci had professional bedside manner, though I felt very rushed through the entire appointment. He would often not let me finish answering his questions about my hip pain, andI felt could have given me more information on day-to-day activities to reduce pain. He saw me for about 5 minutes, looked at my x-ray and suggested I get an MRI. Nice enough guy, and not a bad experience, though wouldn't necessarily recommend. Dr. Capeci is a wonderful orthopedist that I have stayed with for many years!! I highly recomend him. I had an amazing experience, the entire office was exceptional. The doctor was absolutely wonderful and informative. I'm so glad I chose Dr. Capeci. Thank you to everyone at the office. I would not recommend visiting the office. I was misinformed about my insurance and the visit itself was less than 5 mins. Ended up paying money just for the Dr to recommend me to visit a PCP. I appreciated being seen on time. Other doctors (in other practices) make me wait as long as two hours! Dr. Capeci was honest and thorough, regarding whether I had anything that was fixable. He came highly recommended by a good friend, and I would definitely recommend him to others. Kind, prompt and professional- highly recommend! He quickly diagnosed my knee bursitis and confirmed with an X-ray that was done on site. Very nice initial appointment. I was seen right on time (had first appt of day). Nicely greeted. They had my forms. Nice beside manner. Answered all questions and recommended starting with PT. The Doctor was very pleasant however the reception desk has a lot to be desired. The red tape and bureaucracy in order to see this Dr. Is unbelievable. I saw Dr. twice, the first spent two minutes and sent me forxrays. Waited three weeks for the referral for xrays. Got it done through my regular Dr. Because Dr. Capeci’s office staff failed to request it. The second time, I almost did not get to see Dr. because the receptionist claimed they did not have the xray report which the lab faxed three times! After calling the lab myself for the fourth time, the xray report was acknowledged but now the Office staff claimed the Dr would not see me because I did not bring the actual film....they never requested the actual film! Then Dr overheard them and he came out and told them he can access the films online which he did. I am still waiting for the authorization for a hip injection that I will never get from this office... I changed the Dr. I had a wonderful visit with Dr. Capeci. He was well informed, patient, and welcoming. He is thorough, clear, and kind. Everything you want. Thorough, efficient & friendly. Staff on the ball...great that xray equipment is on-site-saved me a trip to other facility. Dr Capeci reads xrays & explains things in plain english. Goo dad bedside manner. He’s absolutely great! Went in for a consultation, needed for a second opinion. He explains everything and you leave with any and all questions answered. The best on all counts! This was the easiest appt. I ever had and the Dr. was really knowledgable! So glad I found him! His staff was also very friendly too. Great Doctor, friendly efficient staff. Confident, well spoken doctor who talked me through my X-ray and MRI scans, answered my questions and gave his recommended treatments clearly and with strong rationale. The office visit with the doctor went well. The check in desk needs a lot of improvement with checking patients in. He was very professional, the front desk were also very professional and the xray xray technology's was very friendly. Great Doctor and staff. Extremely impressed with the Dr Capeci medical knowledge. Dr. Capeci was kind, knowledgeable and answered all of my questions. I arrived a bit early and I was in and out before the time of my original appointment! I highly recommend him. This was my first visit with Dr. Capeci. I found him to be professional and thorough and very nice. Dr Capeci and his staff were great! Any questions I had were answered, and my X-rays were expained to me. I left feeling confident i had chosen the right doctor. I came for a consultation. Dr. Capeci is very knowledgeable,attentive. Great bedside manners. Dr. Capeci was warm and inviting. He was straight and to the point. He listened and gave his honest opinion. Very direct, knowledgeable, and the staff was a reflection of him. I saw Dr Craig twice. Both times I only waited about 20 min and the whole visit would take place around 40 min. He's a very knowledgeable Dr. I definitely recommend him. Great Orthopedic Surgeon. Warm & friendly yet very professional- takes the time to explain everything. Staff is great- the office is very organized and wait time is minimal. By filling out the form online with zocdoc meamt the minute I went in I only had to sign my signature. Was seen by Dr Capeci almost immediately after walking into the examination room. He listened carefully and was extremely detailedin his explaination of the problem and how to move ahead. Staff are friendly and helpful very personal and attentive. Great doctor with a great sense of humor ! He was very nice and attentive. I'm scheduled for future surgery and would feel more adequate answering sometime afterwards, however, I don't feel he gave attention to my complaint that my left knee was buckling and locking up on me, he was affirmative that the " painwas due to arthritis"..I agree, however arthritis isn't causing my knee to buckle under me...Dr.Capeci, don't Only read MRI reports...listen to your pt. The staff was pleasant and efficient. Dr. Capeci was great. It was fast efficient and easy. Even though I got stuck in traffic and was very late- I was able to see the doctor. Everything went well. Everything was explained clearly all of my questions were answered thoroughly. I felt well taken care of. It was effective and efficient. The staff was great and I feel like I got the answers I needed.